I think just about everybody growing up in my generation knows about the Oregon Trail. This might only be true because it seems like every kid growing up in America at that time got to play the Oregon Trail game on the computer while in school. I don't think I ever actually connected the game to the actual reality of the people who traveled westward along the trail until we moved to California and started regularly driving back and forth to visit family and such. We kept seeing all these Oregon and California Trail markers, and it made me start thinking of what it must have been like traveling in a canvas covered wagon with wooden wheels. There was no road - it was only a trail! What's even more awesome is that a lot of today's modern highways are built right on the old trail, so you can literally travel in the same tracks. Skiing in to the Stump Creek Guard Station along the Stump Creek. 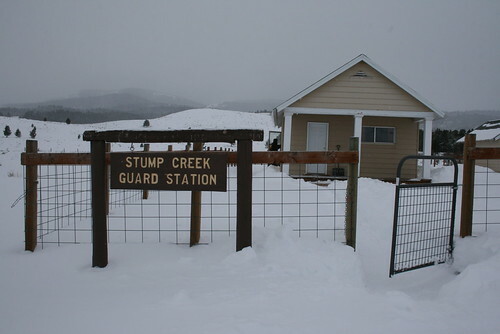 Right now we are spending part of our winter break relaxing at the Stump Creek Guard Station, a cabin owned by the Caribou-Targhee National Forest in Idaho. It is built along Stump Creek, which meanders along a shallow valley along which the Lander Cut-off of the Oregon Trail was built through. The nearest town (Auburn WY) was settled by a family who ended up stopping their journey to Oregon short. Because so many people traveled along the main route of the Oregon Trail, there were plenty of men who looked for shortcuts. Often through rougher land than the main trail, the shortcuts still got pretty well used. The shortcut that passes right by the cabin supposedly would have cut off 7 days off the entire journey. That's a lot! Our home for the next three nights! We had no idea that the cabin was in such a historical place when we originally rented it out. 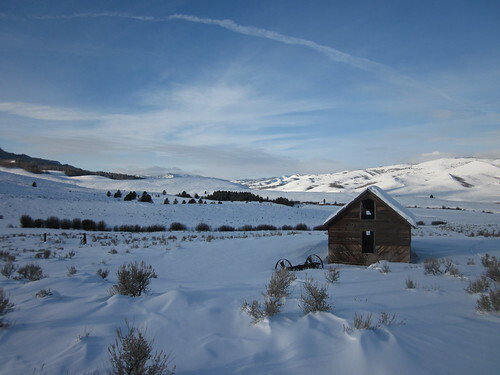 In fact, we weren't even planning on it until a blizzard and sub-zero temperatures in the Jackson valley made us rethink our plans about camping out at Granite hot springs! We needed a cheap place to stay and this cabin was it, at only $35/night. 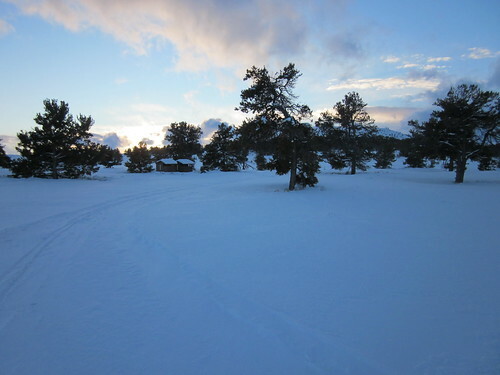 The only catch was that the road to the cabin was not plowed, so we had to ski in. But that made it all the more awesome! The ski pulk came in really handy. When we got to Auburn, we hit the local grocery store and loaded up on food and other supplies. We were able to carry all of the food because of the pulk. It felt so luxurious to know that we were going to have omelets for breakfast, fruit juice, cookies, wine, and other goodies! We could not of carried this all on our backs. It took a while to get it all packed up on the small pulk, but soon we were ready to go. We had a little over a mile of skiing from where we parked the car to the cabin. We checked out the route on Google maps before hand, but of course, everything was covered in a couple feet of snow now, so we hoped it would be pretty obvious and we wouldn't get lost. 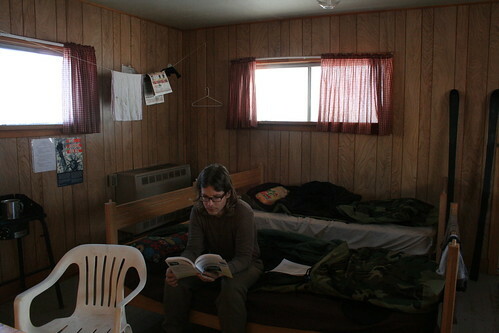 The cozy interior of the two-room cabin. Everything turned out simple and easy getting there. There was even a small brown sign that marked the turn off of Stump Creek Rd to the cabin. When we got to the door of the cabin, that's when the work started. Nobody had been there since it started snowing. At least that's what it seemed like because we had to shovel our way in! Once we got in, we had to figure out how to turn on the heat. There was a propane furnace and a propane stove, but the big tank of propane was behind the cabin under a couple feet of snow. So the next thing we had to do to dig our way to the tank and turn on the gas. Once it was flowing we cranked up the heat, but only after some drama with the pilot light not staying lit! Willows grow in Stump Creek. You can see the cabin in the background. It wasn't long until the whole cabin warmed up. We kept it at about 80 degrees for the first few hours. Once we were warm, we kept it at about 65 for the rest of the time. The temperature was dropping outside and a blizzard was supposedly rolling in and out. 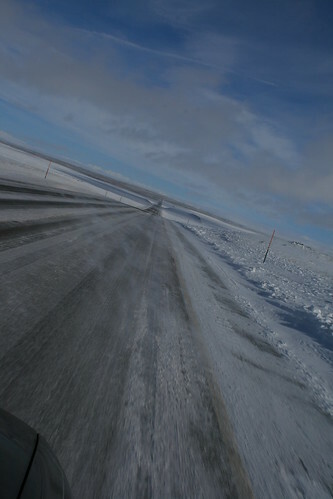 From where we were, you couldn't see much in the distance because of the snow coming down, and the winds were strong. We decided to just relax in the toasty cabin while the weather went crazy outside. But we did have to venture outside to use the outhouse! But first. . . . yes we had to dig our way to it. Then once we got there the door was jammed shut due to a build up of ice on the ground. We had to get out our avalanche shovels and hammer at it for a while to try and break it up. Just in time cuz I really had to go! 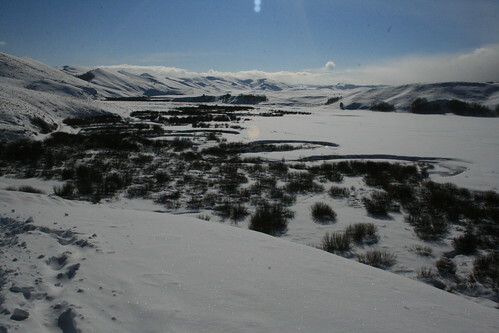 Stump Creek meanders in the valley. The propane stove inside was awesome! We could cook anything we wanted! As dark fell, we even got to use a propane chandelier of fancy looking coleman-style lights with the socks. But they weren't burning properly, and after a while the carbon monoxide alarm went off, so we shut them down. We were in the dark now! The next day we decided to ski back to the car and drive back into town for some candles so that we could have light for the rest of the nights. Everything looks better in candlelight. 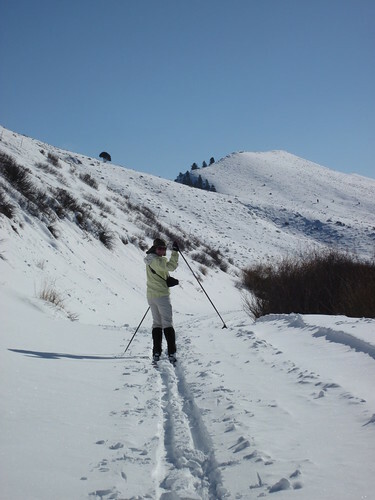 Going for a ski along Stump Creek Rd, possibly the old Oregon Trail. On the last full day at the cabin, we took a ski trip along Stump Creek Rd, which I think was right where the Lander Cut-off for the Oregon Trail went. The night before it was below zero overnight, so the air was really crisp, and so was the snow. After a little while down the road, we saw horse tracks that broke through the deep snow. We followed the horse tracks down the road and saw people camped out under tarps next to a few horses. The horses were in a wooden fenced enclosure and looked really cold! You could see the breath while they were breathing. There was fire smoke coming out of a little metal chimney pipe that was sticking out of the tarp tent. To me it seemed crazy, camping out for what seemed like no reason, with a few horses. How long were they there for already? An old barn near the guard station. We skied along the road, which followed Sump Creek, for about 3 or 4 miles. Then we decided that we should turn back. So off we went back towards the cabin. This time the skiing was easier because we stayed in the same tracks we created on the way out. So we got back sooner than we thought we would. We still saw the people with their horses, keeping warm under the tarps. Since there was still plenty of sunlight left, we started skiing around the cabin. We found an old barn that looked like it was abandoned. It had wolf or coyote prints all around it in the snow. It even had really old farm equipment in it. As we were exploring the area, the sun started to go down. The temperature dropped so fast, it was unbelievable! I started getting really cold all of a sudden. My hands hurt and my face started hurting (that was a first!) and all my muscles started feeling really tight. 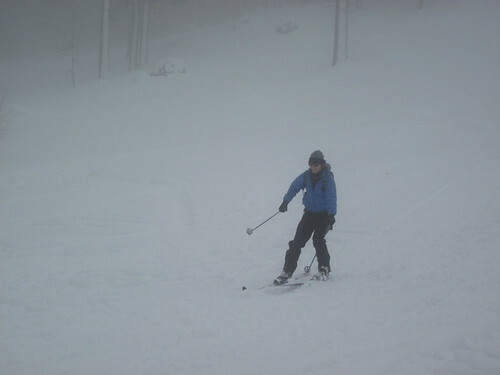 Good thing we weren't too far from the warm cabin, so I skied back as fast as I could. When we got back, I made some hot cocoa. A beautiful sunset at the Stump Creek Guard Station! It was new year's eve, and we planned on staying up til midnight. 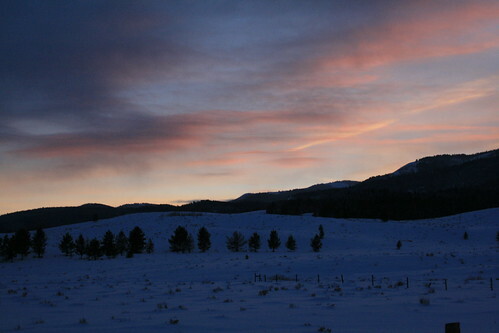 But it was kind of tough to last until midnight, since the sun went down by 5pm, and we skied all day, so we were tired! But we managed to stay awake, drinking some cheap wine we got at the grocery store, and doing crossword puzzles. Oddly enough, I actually liked doing crossword puzzles! The next morning we packed up our things and headed back out to the car. When we got there, we had to uncover the Daewoo from all of the snow that had fell over the past couple days. We were so busy unpacking that we didn't even notice the people and their pack of horses had been following us! When we turned around, there they were - the people who were camping under the trap tents! Turned out they were only camping or something and now were waiting for a horse trailer to pick them up by the plowed road where we park the car. We left before we saw them load the horses into the trailer that was supposed to come. On our way to Wyoming, we drove through southern Idaho through the Snake River Plain. There was so much snow! I've always had a dream to ski in Craters of the Moon National Monument, which protects the majority of a young lava field (so young that there aren't many plants growing on it yet). There's just something so ironic about a lava field being covered by snow! In the summer, it is sooooo hot here, but right now, the winds are howling, snow is being blown all over the place, and its in the mid 20s! We had an opportunity to ski in the park since we were going to pass it on our way to Jackson Hole, so we stopped at the visitor center to inquire about skiing. Along with one other car, we were the only ones in the whole park! Skiing to our camping spot for the night! The ranger answered all of our questions with no rushing us out of there, since we were the only ones in the visitor center. He told us that we could ski along the only road through the park (about 7 miles round trip), which was groomed once a week. 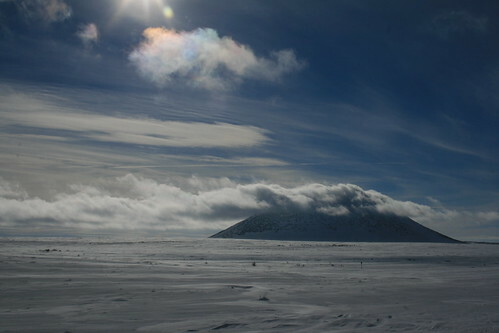 We could also do tele skiing on any of the cinder cones that we wished, but he warned us against going on the young lava field, since it is very uneven and cracked. When we asked about snow camping, he said we could camp at the ice caves, in the parking lot (which was now under a couple feet of snow, so you can't tell its a parking lot). We figured that we weren't going to make it all the way to the Tetons before dark fall, so maybe we should camp at Craters instead. 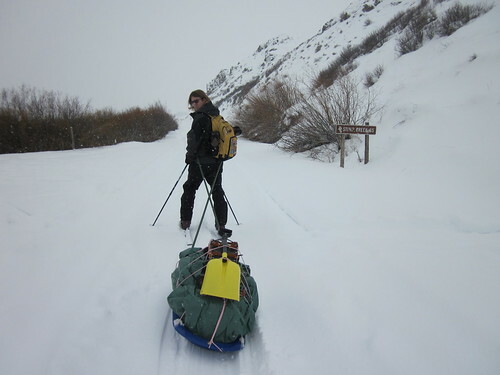 It would give us a chance to test out if the ski pulk we made a few days ago really worked. 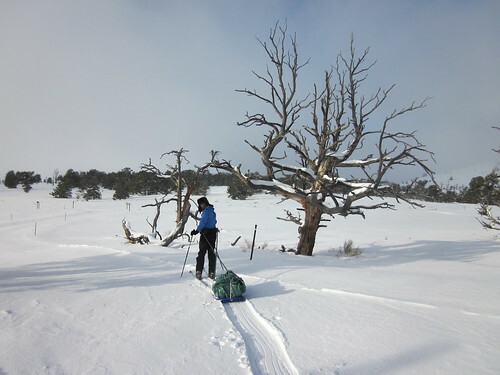 Romy pulling the ski pulk along the ski trail in Craters of the Moon. So there we were, filling out a back-country permit to go snow camping overnight in Craters of the Moon! It was supposed to be in the mid 20s overnight with a chance of snow, so we made sure to bundle up. It took us almost an hour to pack everything we wanted into the pulk and into the backpack before setting off on the ski trail. We made sure to pack everything we needed to keep warm and stay comfortable for the night. That included our 4-season tent, cold weather Army sleeping bags, pillows, warm cloths, and high energy snacks. We didn't bring the stove or anything, since we only had food that didn't need to be heated. We brought enough water with us in the pulk so we wouldn't need to melt and boil snow. 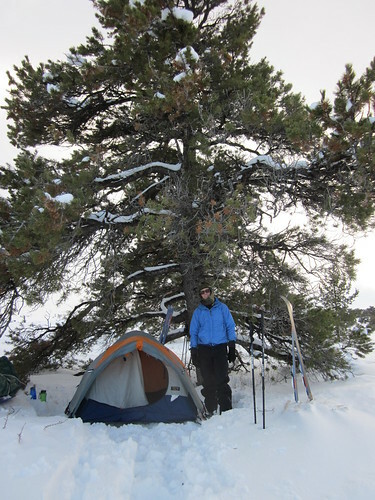 We camped under the protection of a broad tree (it was windy in the afternoon) near the ice caves parking lot. We have about 2.0 miles to ski to the camping spot near the ice caves. It was relatively flat with some up and down parts. 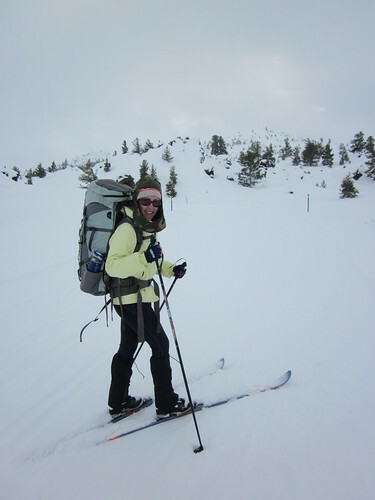 I had the backpack on for the ski to the caves, and Romy had the pulk. It was kind of tricky to keep my balance on the skis with the backpack on at first, and I fell backwards after only a quarter mile! But it was in slow motion, so I didn't hurt myself. Romy was pulling the pulk, which was pretty much weightless unless you were going uphill. But it did add drag, so he wasn't able to glide as efficiently with the pulk on. Also, we noticed that the rigid poles weren't attached to the hip belt tight enough, so the poles would get jerky sometimes as you stride because there was too much play. That is easy to fix though, we just have to tie it on tighter to the waist belt. Sunset at our campsite near the ice caves. We passed by some amazing scenery. 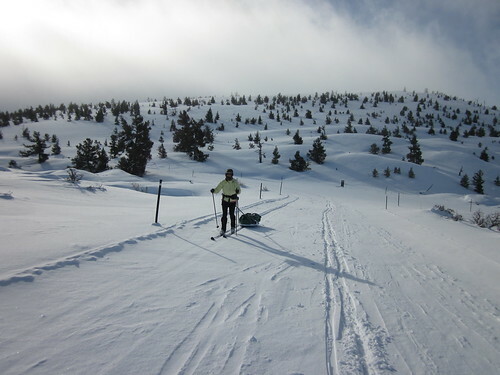 As we skied, we went past snow covered cider cones and lava fields. Scraggly trees which were bent by the wind stood along the trail. Sometimes, tall jagged spires of hardened lava stuck out of the snow too. We didn't see any animals, but we saw bunny tracks in the snow. The sun popped in and out of the clouds, and as we neared our camping spot, the wind started calming down a bit. The low clouds that obscured our view of the huge mountains to the north cleared and we were left with an amazing view! Popping out of the tent in the morning like Marty Stouffer in one of his Wild America episodes!!!! When we reached the ice caves area, there were a few trees that were so broad, a tent could fit under their protective branches. This seemed like the most logical place to put our tent, so we skied up to one of them. We started stomping the snow down with our skis. 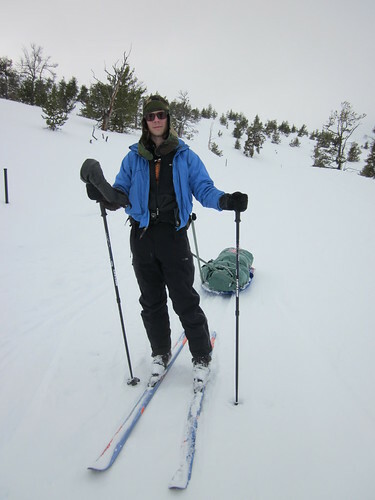 Then when it was all flattened out, we took the skis off and stepped onto the snow with our boots. My leg sunk 2 feet down into the snow, just past my knee! I guess we didn't stomp the snow down enough, and the snow was really deeper than we thought! So we started stomping on the snow with our boots, and finally got it compacted enough to build the tent on it. Skiing back to the visitor's center the next morning. 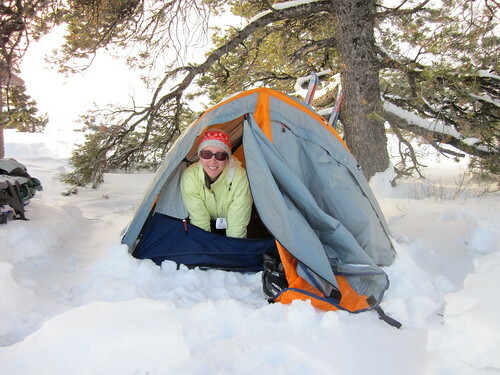 The snow wasn't too compact enough to stake the tent down, but that was okay, since the wind completely stopped by now. So we just set up camp, and as we finished, the sun began to set. It turned the sky all kinds of colors! But it also started to get much colder, so we got in the tent and put all of our cloths on. Then we snapped our sleeping bags together and got in. We were kind of tired, so we decided to go to sleep when it got completely dark. After a few hours, we both woke up, and couldn't sleep. We didn't bring a watch or our cell phones, so we were guessing what time it was. Who knows? Than we fell aslseep again and when we woke up, it was light out! My turn to pull the ski pulk on the way back. Our neighbor gave us a banana bread loaf for Christmas, and we took it with us and had half of it for breakfast before we packed everything back up and broke down the tent. It was pretty quick. One benefit of snow camping is that nothing gets wet because if it does, it just freezes right away. The frost is easily shaken off or rubbed off. Nothing gets dirty either because the snow is clean. Once we were ready to go, we started skiing back towards the visitor center. Romy started pulling the pulk back, but then we switched so that I pulled it and he put the backpack on. A cloud covered butte along the road to Idaho Falls on the Snake River Plain. It seemed to be a lot colder that morning than the day before. As we skied back, my fingers were so cold that they hurt, even though I was really warm from skiing. Then I realized that the pole strap around my wrists was very tight and my circulation was being cut off! After I loosened the straps, my fingers felt a lot better. Anyways, we finally made it back to the car and visitor center, and packed everything back into the car. Then we stopped back into the visitor center to let the ranger know we made it back from the camping trip. The ranger was so nice, and he made us some hot cocoa in the back office! It was sooooo good! After we finished, off we were, back on the road. It took us the rest of the afternoon to get to Jackson, Wyoming. Blowing snow over the road to Idaho Falls. It was cold and windy! Today Romy and I made our own homemade ski pulk. 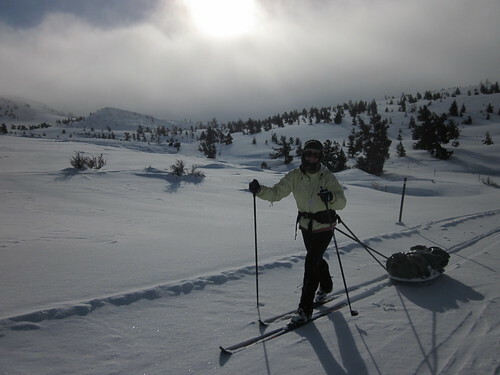 A ski pulk is a sled that is attached to a skier's waist via a hip belt and rigid poles. Its meant to be used to carry stuff, like camping gear. All your gear goes on the sled, which slides behind you on top of the snow, instead of being carried on your back in a big backpack. Most people who use them make their own because its so easy! All you need is a kid's plastic sled, two rigid poles, and some hardware to attach everything together. I took pictures while I made the pulk today. I got the design ideas from a website put together by Ed Wilderness Systems. He has a free pdf with a bunch of designs on how to make your own. Threading the rod ends into the pole ends. I got the kids sled from Any Mountain in Berkeley. They had 3 and 5 foot sleds, so I bought the 5 foot sled for $14.99. It is made from pretty beefy plastic. It needs to be because a lot of holes have to be drilled into the sled, to attach the poles and grommets for rope. 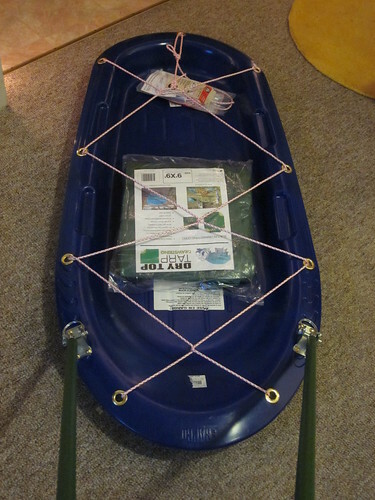 Once I got the sled, I drove to OSH (a hardware store) to get the rigid poles and other hardware. The garden section had all kinds of long rigid poles. I at first wanted solid fiberglass poles, which was recommended in Ed's pdf designs, but when I saw them at OSH, they were very heavy. They only had 1 inch diameter pole that was 5 or 7 feet long. 5 feet was too short, and 7 feet was really getting heavy. 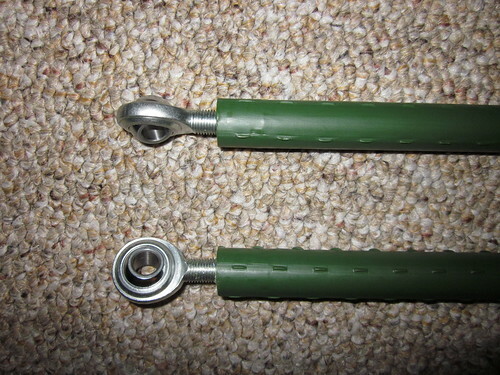 They also had plastic green poles which I think have a little bit of steel reinforcement. They were really light and not too flexible (you don't want them to snap under the load of the sled when you go downhill), so I got the 7 foot long green plastic poles. I hope they work! We shall see next week! The rod ends are fully threaded in and ready to be attached to the sled and waist belt. Then I moved on to the part of the store where they sell hardware. To attach the poles to the sled, I liked Ed's design of using a threaded rod end which has a bearing inside of it so that anything put through it can pivot slightly. The rod ends slips through a locking small hitch pin thingy. According to Ed's design, the hitch pin is then put into aluminum channel stock that is cut into a two inch piece. I looked all over and even asked the store manager at OSH, but they had no channel stock. But Romy came up with an ingenious idea. Caster wheels!!! 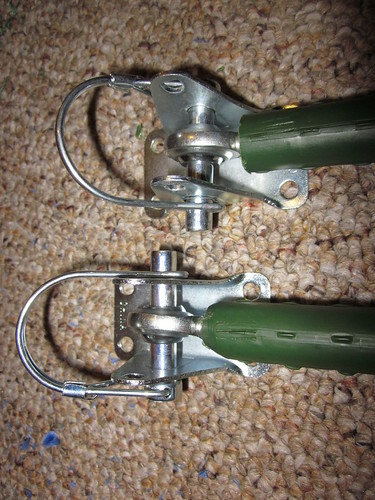 The rod ends attach to a lock hitch pin, which is slipped into a caster wheel frame (without the caster wheel). 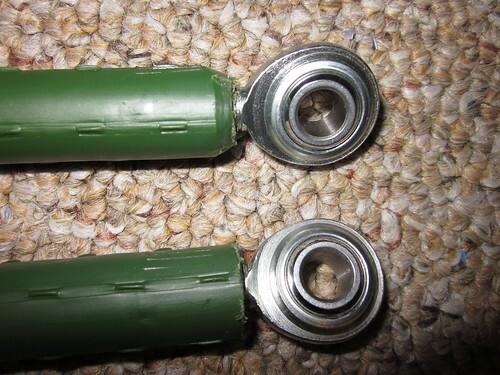 Basically, you take a caster wheel, and pull the wheel off, and you're left with just the frame which is like a small piece of channel stock, but better, because it already has a mounting system. We had to drill out the holes to be a bit bigger, to fit the thick locking pin. Then, this whole assembly gets bolted to the sled by drilling four holes into the sled near the front on each side. The whole assembly is bolted onto each side of the sled, towards the front. The poles can pivot a little. 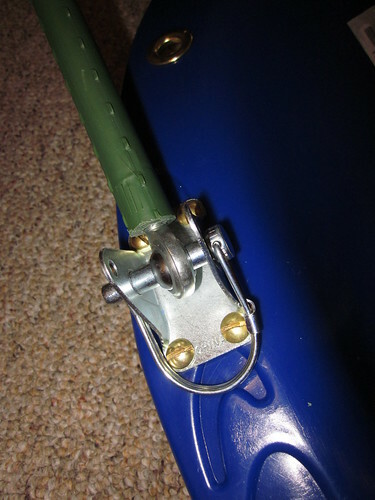 The beauty of this type of system is that the poles can be removed from the sled by just slipping off the locking pin, but the pin is very stable while it is locked in place. The other ends of the poles are tied onto the waist belt. We have a couple hiking backpacks, and one of them has a removable waist belt, so we are using that one for the pulk. I put some grommets along the edges of the sled so that rope can be strung through to secure the cargo. Finally, to secure the cargo on the sled, I put some of the left over grommets I had from making my yurt along the sides of the sled. Once they were all punched in, I strung rope through it like a net. All we have to do it wrap our stuff in a tarp, place it in the sled, and tighten the rope. Then it should be all set to go! We'll be using it on our trip next week in Wyoming, where we'll be skiing to a back country cabin we rented from the Medicine Bow National Forest. 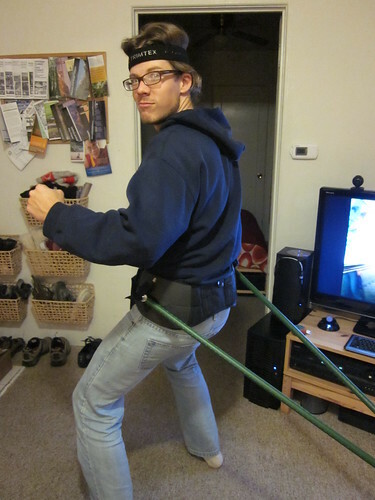 Romy demonstrates how the hip belt is worn, where the other end of the rigid poles attach. Using the pulk to carry our camping equipment in Craters of the Moon National Monument, Idaho. We loaded the pulk a lot on this trip to a remote national forest cabin in Idaho, and it was a very smooth trip! Now that school is over for the year, we are on winter break and decided to get into skiing a lot more than we have in the past. 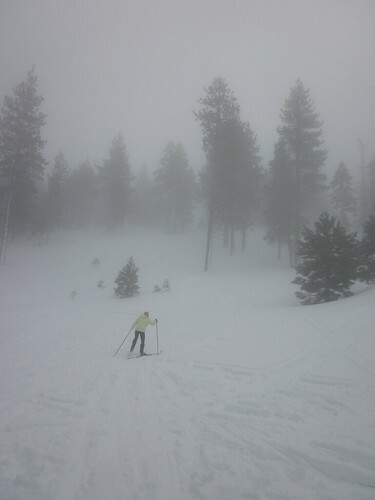 We kicked off the skiing season with a trip to Lake Tahoe to go cross country skiing. My goal is to get in shape, and enter and finish the Mammoth Marathon (42 km) on my skis in April at the end of the season! I'll be working towards that goal all winter long. Along the way, I want to participate in a few other XC races, all listed here. 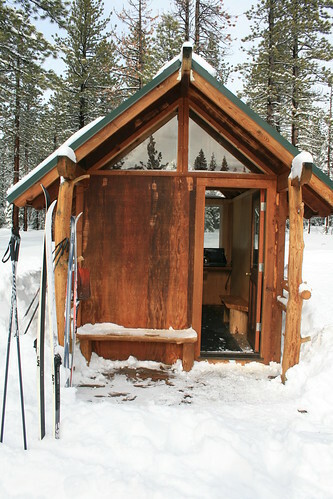 One of the warming huts at Tahoe XC, where we took a break and had hot cocoa. Another nice thing about being on winter break is that we don't have to do all our traveling and fun stuff on the weekends only. Going to Tahoe mid-week is incredibly cheap! We got our motel room for only $30/night! And it had a jacuzzi, free breakfast, and it was only 3 blocks away from the casino area near the Cali-Nevada state line. It was clean and quiet, too. The place we went skiing at, Tahoe XC, had a half-off Tuesday special on trail passes, which made it only $12 to ski on Tuesday! And on Wednesday, they have free skate lessons at 10am. Mid-week is awesome! Oh, and there were less people too. Romy skiing. There is a lot of fresh snow! 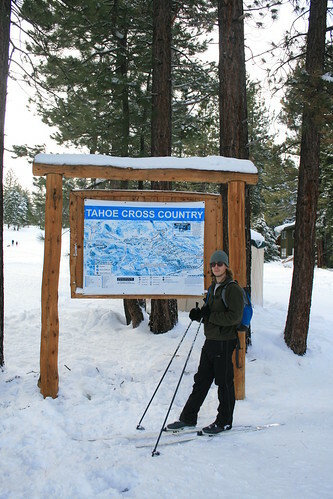 We took out our nordic classic skis the first day of skiing at Tahoe XC. The trails snaked their way through a jeffery pine forest which is normally a state park when its not covered in a many feet of snow. The couple of days before we got there, all of the Sierras got a couple feet of fresh snow, and the compacted base beneath our skis was at least 4 feet deep! Some places already had 13 feet, and it's not even Christmas yet! The trails were all groomed, so we looked at the map and decided to take the biggest loop we could. Since it was our first day, we stayed on greens and blues. We also saw on the map 3 warming huts that had a propane stove, water, and a kettle, so you could brew yourself some hot tea or make hot cocoa. We decided to go warming hut hopping! Taking a break from skiing! We maybe over did it a little on our first day! We skied a total of 16 km (a little more than 1/3 of a marathon) and I felt my muscles getting sore towards the end while we were still skiing. Stopping to have hot cocoa and tea was nice. Cross country skiing uses your whole body, but mostly your quads and inner thighs on your legs, and triceps and shoulders in your arms. You also use your abs for stabilizing and balancing on your skis. The trails are mostly level, so you use your own power to move forward on the skis. Its like jogging. Skating I think is even harder. There were a lot of skaters on the trails. We want to rent out some skate skis and go for the free lesson on Wednesdays to see what its like. Skaters go a lot faster because the motion is more like roller blading on skis. Romy next to the big trail map at the end of our day at Tahoe XC. When we finished the giant loop, we hopping in the car and drove to our motel in South Lake Tahoe. We drove along the Nevada side, because I think its nicer (not as many towns, and better views). When we finally reached our motel, we were pretty hungry, so we walked to the Stateline Brewery in time for their happy hour, where that were serving $3 pints of their homebrew and also had cheap mini pizzas! After dinner I was totally exhausted! We had plans on going back to Tahoe XC for their free skate lesson the next morning, but instead, we decided to sleep in and take it easy and go find some place to test out our back country XC skis instead. Climbing the hill to try skiing down it with the back country skis. We drove up to Spooner Summit, which is the top of the mountain pass on Hwy 50 between Stateline and Carson City, NV. There is a plowed parking area for snowmobiles off the side of the highway. In the summer it is one of the trail heads for the Tahoe Rim Trail, a trail that encircles Lake Tahoe. 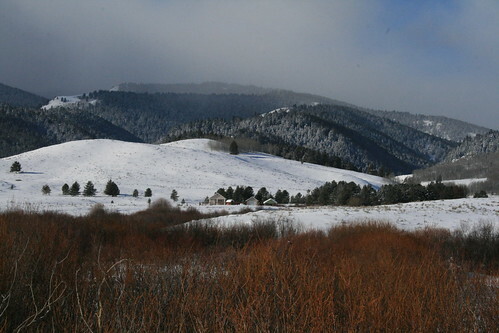 We parked there and got out our back country XC skis, which are a hybrid between downhill skis and cross country skis. They are long and have a fish scale grip bottom like an XC ski, but they are wide (for flotation in deep snow) and have metal edges like a downhill ski. The bindings are a little beefier, and the boots are stiffer and higher, so you can maneuver on downhill turns. We will be using them this winter on our trip to Wyoming to the Tetons, so we needed to try them out (we got them used from craigslist). Plus we've never skied on skis like these before. Romy skiing down the hill near Spooner Summit in Nevada. We skied down some snowmobile tracks until we found a nice hill that was clear of trees and had fresh powder. It was tough climbing up the hill in skis (I had to climb with my feet and skis spread apart in a V shape) because sometimes I would start sliding backwards down the hill! Eventually we got the hang of it and got to the top, and skied down a few times. We discovered a few things from doing that. First, Romy's skis need to be waxed because they were building up snow at the base, which really hinders motion. And second, I need to tighten my boots because the long skis were really hard to control on the way down! I think we will have to have more practice using these skis on downhill sections, but along the flat terrain, they worked very well as XC skis. We did much better skiing the downhill parts of the hill that had powder vs compacted snow from snowmobile tracks. I think the skis are designed to handle better in ungroomed snow than on groomed snow. A video of me falling down after hitting snowmobile ruts in the snow. Romy also decided to take a video of me while I was falling after I hit snowmobile ruts on the way down, near the end of hill. I look so funny! So after a few times of going up and down the hill, we headed back towards the car. We were pretty pooped out! 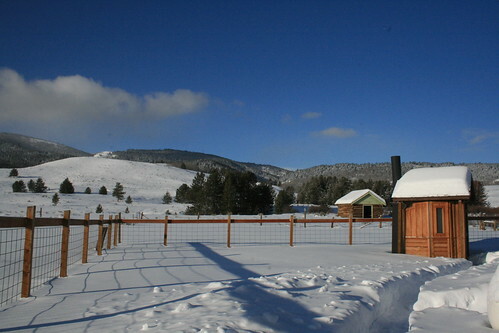 But now we have a couple days of rest before we get out on our skis again in Wyoming. 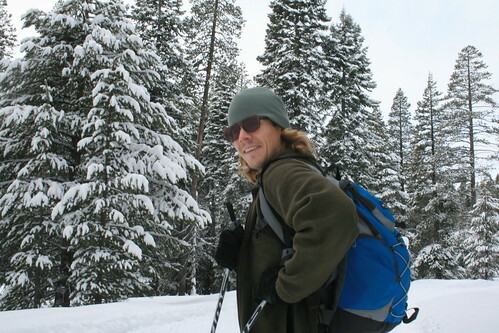 We are planning to go snow camping in the back country with our skis to visit some hot springs near Jackson Hole. Can't wait!!! My mom came to visit us for Thanksgiving break, and she stayed for two weeks. The first week we mostly had off from school, and we went to Saline Valley. The second week, we were pretty busy with school since it was the last week, but we squeezed in a trip to Alcatraz, since my mom never went before. We got on the 10am ferry to the island today. 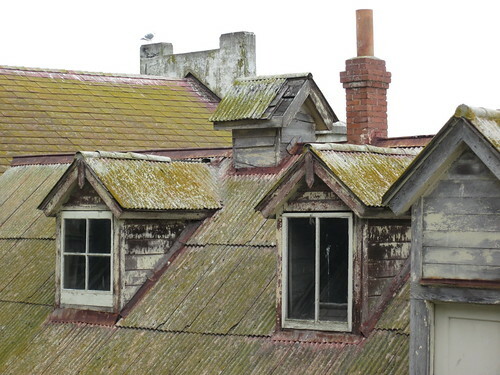 Moss covered roofs near the dock on Alcatraz. We were in for a treat because it was in the middle of the week, and kind of slow tourist-wise. So that meant that there weren't too many people going to Alcatraz! When the boat landed at the dock on Alcatraz, we were in for another treat. Apparently, one of the last surviving prisoners that was actually imprisoned on Alcatraz was in the gift shop signing copies of his book. We didn't buy his book, but it was kind of interesting hearing him talk to people. And wait, there was even another treat. A ranger-lead tour called "The 6 Hats of Alcatraz" was about to start, just as we got off the boat! The ranger who lead the 6 Hats tour. I'll try to recall the most interesting parts of the tour. The ranger had 6 different hats inside a big canvas bag. Starting with the oldest, historically, he put each hat on, one by one, and told a story, pretending to be the historical character based on the hat he was wearing. The first hat was an old military hat, from the 1800s. 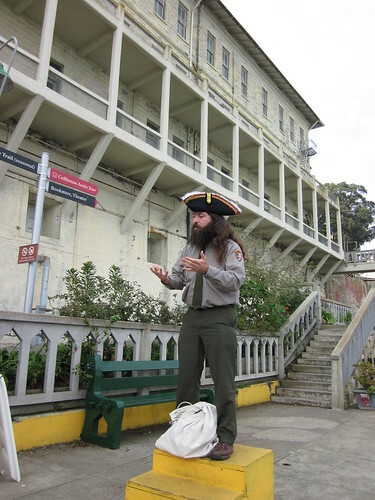 While he was wearing it, he pretended to be an old military officer that was stationed on Alcatraz Island while it was a fort that protected the golden gate (which is what the opening to the ocean was called, what the famous bridge is now named after). He told us that the island used to be a bird nesting site, and that the steep cliffs were actually blasted that steep on purpose with dynamite. The military wanted to make it very hard for ships to dock on the island, so they made it all cliffs, except for the backside of the island, where they kept the only suitable docking location. They also built the only entrance to the fort by the dock on the backside, and protected it strategically with shooting towers and huge canons. A row of prison cells. Then he put on another hat, which was also military related. But this time it was a military prisoner. After the fort was no longer useful, in the early 1900s, the island became a military prison. They kept the prisoners in wooden cells, which were over crowded. They also dug caves into the bedrock and used them as cells. They were often damp and cold. 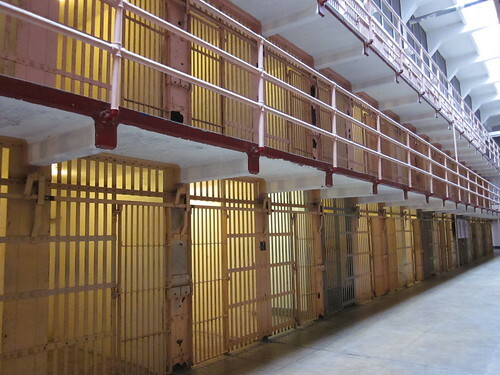 Eventually the prisoners were forced to build a new set of cells, but out of brick and concrete instead of wood. This was after the 1906 San Francisco earthquake, where the whole city burned down due to all the buildings being made out of wood. Well, they eventually built the largest steel reinforced concrete building in the country at that time. That building became the new cell house. 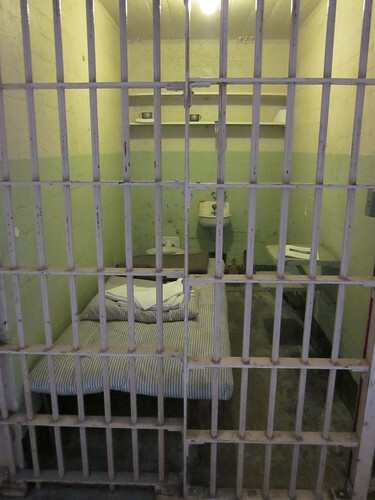 Inside a typical prison cell. Next the ranger put a new hat on, a prisoner hat. The next part of the Alcatraz story is now about mobsters and gangsters. 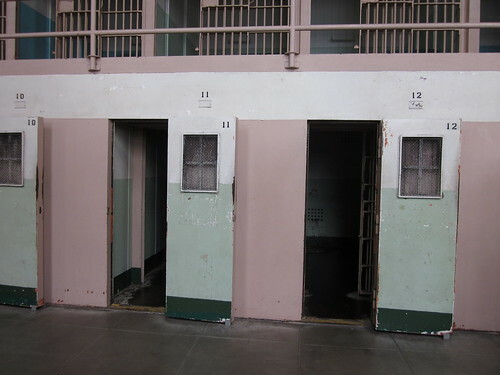 After the original military prisoners built the new cell house on Alcatraz, there weren't enough prisoners to fill it all up, and the military was moving away from the island anyway. But at the time, prohibition began and all the mobster action started. The government needed a place to put all the gangsters they were arresting, so they sent a lot of them to Alcatraz. 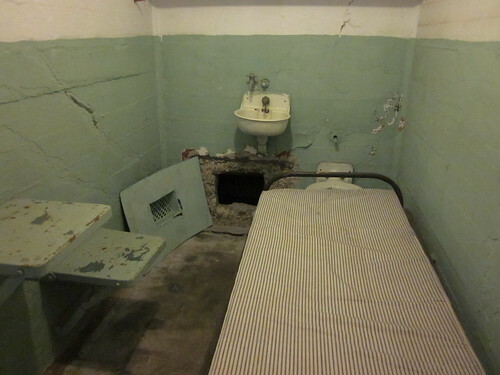 Al Capone was on Alcatraz for a while, although they didn't tell us which cell he was in. They said he was in many different cells while on the island. Anyway, so the huge new cell house finally was put into use, and it officially became the Alcatraz Penitentiary. I'm not sure if there was a hat between the prisoner and the hippie. Well anyway, the next hat he put on was a hippie bandana. Eventually, the prison was becoming too expensive to run, because everything had to be shipped back and forth to the island. So they decided to shut down the prison. After it was shut down, nobody wanted it, so the government kind of let it rot for a few years. Somehow, some native Americans stretched the meaning of a treaty and claimed the island as theirs, because it was technically surplus government land, which they were entitled to. The weird thing was that it was a bunch of Indian tribes that were not native to California, supposedly. So they took over the island. This was in the 60s, so a bunch of hippies joined them, although at first, they exclusively only let Indians on the island. A huge hole scraped into the concrete behind the air vent as part of an escape scheme (it was successful)! Then the ranger put on his final hat, which was a National Park Service hat. He said that at the tail end of the hippie take-over, there were a few fires on the island, and some of the buildings were burned down. None of the hippie commune hippies on the island took the blame, and to this day, its thought that the fires were actually set by under-cover government agents who set the fires on purpose to make it look like the hippies lives were in danger. In general, it made it look like it was dangerous to be there and gave the government an excuse to kick everybody off the island for safety concerns. It worked, and supposedly, some of the classified government documents that described the plans to burn down some buildings on Alcatraz were recently released. So after the hippies were kicked out, the government eventually set it aside as a National Park. In fact, its been a National Park longer than it was ever a penitentiary! The 6 Hats tour was over an hour long. After the ranger was done story telling, we took the audio tour of the prison. They give you big headphones and you listen to a recorded tour, which includes the real voices of some of the prisoners and guards retelling stories. But its funny, because everyone inside the cell house also has on huge headphones, and can't hear anything else. People bump into each other because they get so engrossed in the story they are listening to, plus they can't hear other people walking around them, so there are often collisions. We spent about 3 hours on the island, and then decided to go back, because we were getting hungry and still had a long way back home. This is a Flickr badge showing items in a set called A Foto Each Day. Make your own badge here. This blog template is design by Jenn! and inspired by the paintings of Grant Wiggins. Powered by Blogger.